Bates’ Best honors are awarded annually to dedicated alumni and parent volunteers who express a passion and commitment for advancing the mission of the college. The following alumni received their Bates’ Best awards in 2018 during Back to Bates: Homecoming and Family Weekend. Missy, you are the definition of a “Bobcat superfan” and a dedicated Bates parent. During your son Ned’s time on campus, you’ve been “all in” for Bates—sharing your experience with prospective students and families at every available opportunity. Leaning on your extensive background in college counseling, you’ve welcomed new families to Bates by warmly and empathetically answering their questions, and assuaging their concerns. From making personal welcome calls to incoming Bates families, to volunteering on the Parents Fund committee, and speaking to admitted students, you have helped set the tone as families begin their journey at Bates. As Ned enjoys his last year on campus and begins to think about life beyond Bates, we share in your and Rich’s excitement for the opportunities that lie ahead. We know that your relationship with the college will continue to evolve and grow as you transition from the role of parents of a Bates student to parents of a Bates alumnus. Jen, it’s no stretch to say that you are among the Bates’ most dedicated volunteers. Through your service on the Alumni Council over the past three years, and now as its Vice President, you’ve played an important role in deepening alumni engagement with the college. Specifically, your work on the governance subcommittee has helped council leadership communicate and connect with the broader alumni association. Your thoughtful recruitment of new members has brought rich, diverse perspectives and voices to the council. And at regional and campaign events, you’ve served as a bridge between alumni who’ve recently graduated and those more established—helping alumni realize the power of the Bates alumni network. In addition, you’ve been a steady leader for the Class of 2001, having served as a longtime class agent, and on the committee for every one of your reunions. Fellow classmate Jennifer Carleton describes you as, “a quintessential Batesie who gives generously and humbly.” We could not agree more with that assessment. Thank you Jen, for all you have done and continue to do for the college. You are truly one of Bates’ Best. Our final Bates’ Best award recipient this evening is Cynthia Kalber Nordstrom, Class of 1962, and parent of alumni of the Classes of 1993 and 2003. Cindy, could you please join me up front? Cindy, as secretary of your class for the past twelve years, you’ve played an instrumental role in keeping classmates connected to each other and to the college. Through your own personal outreach and creative communications, you’ve gone above and beyond to evoke warm memories of Bates and the lifelong relationships forged on campus. Leading up to your 50th Reunion in 2017, you crafted a biweekly email newsletter titled, “50 Years Ago Today”— an impressive compilation of headlines and photos from the Bates Student published on that day in 1962. These efforts have undoubtedly had a marked impact on the Class of 1962’s engagement with Bates. In speaking with your peers, it is clear you are a well-loved and admired leader and friend. Fellow member of the Class of 1962 Ed Wilson was quick to note that he, and many others, are grateful for your efforts and proud to call you a classmate. Cindy, thank you for all you have done and continue to do for the college. You are truly one of Bates’ Best. The following alumni received their Bates’ Best awards in 2018 during Reunion Weekend. Liz and Jon, you are what we might refer to as a young alumni “dream team.” You’ve been champions of fundraising for Bates since graduation, and in particular this past year serving on the Bates Fund Executive Committee. You both care deeply about how your class performs, serving as class agents for the last five years and as volunteers for your 10th Reunion committee, for which Liz is co-chair. And your pride in Bates extends to athletics and alumni engagement, where you’ve helped boost attendance at numerous college events in Boston. Jon, you’ve mentored Bates interns at your company, one of whom was so motivated by your leadership that he now serves as a young alum member of the Bates Fund Executive Committee. Celebrating your 10th Reunion, you’re at a unique point in your alumni journey. You are transitioning out of BOLD and into a second decade that will provide new opportunities — and challenges — for engagement with the college. We know you will shepherd your class through this important transition, and that your continued leadership and advocacy will be central to 2008’s future successes. Thank you, Liz and Jon, for all that you have done and continue to do for the college. You are truly two of Bates’ Best. Nancy, as chair of your 50th Reunion yearbook committee, you have played an integral role in helping your classmates reconnect with the college. You recognized their desire to better understand today’s Bates students, and incorporated a “then and now” section featuring the perspectives of current students juxtaposed with your classmates’ memories from the 1960s. You recruited and collected over 130 submissions for the yearbook, and helped with Reunion planning and fundraising. You have already taken the initiative to connect with volunteers in the Class of 1969 to share your experiences so that they, too, can be successful in their efforts. You bring a spirit of generosity to everything you do. We are grateful for your energy, drive, and passion for Bates. Nancy, thank you for all that you have done and continue to do for the college. You are truly one of Bates’ Best. Jason and Lauren, as co-chairs of your Reunion committee this year, you have set a high bar for 25th reunion classes to come. Thanks to your open and collaborative style of leadership, you reached a wide array of affinity groups from your class and connected them to one another and to the college. When you heard from a classmate that she wanted to receive news but was not on social media, you took it upon yourself, Lauren, to create and send weekly e-newsletters to your class. You have both served as gift committee members and championed your class’ fundraising efforts, in addition to social planning and recruiting classmates to attend Reunion. Your hard work has paid off. This year, the Class of 1993 has shattered the previous record for 25th Reunion attendance of 24 percent. Over 32 percent of your classmates are here on campus this weekend. This is a huge accomplishment. The Class of ’93 is now the class to beat. Jason Hanley and Lauren Fine, thank you for all that you have done and continue to do for the college. You are truly two of Bates’ Best. Mike, I can honestly say that your fondness for and dedication to Bates knows no bounds. During your time at Bates, you were involved with your class’ senior gift campaign, and we’re so grateful that you’ve remained engaged ever since. You helped select the next generation of Bobcats as an Alumni-in-Admissions interviewer, and served on your 5th, 10th, 15th, and most recently 20th Reunion committees. This year, as Co-Chair of 1998’s Reunion committee, you’ve worked tirelessly to connect with and encourage your fellow alumni to give to Bates, eagerly taking on additional assignments to help your class reach its goals. And you didn’t stop there. In March, you were a driving force for Great Day to be a Bobcat, where your outreach to peers garnered the most donations of any alumni volunteer. Great Day would not have been nearly as successful without your enthusiasm and persistence. You are a leader and an advocate for Bates, and we look forward to your continued strategic partnership in the future. George and Dottie, you have been described by your classmates as the “heart and soul of Reunion planning.” You’ve taken the initiative to send communications to classmates, and also educated your peers about retirement tax laws and the opportunities they present for giving to Bates. For Great Day to be a Bobcat you and another classmate put forth a match which you generously opened to all classes of the 1960s, helping to boost participation and fundraising for this important decade. George, you also stepped into the co-chair role for your 55th Reunion this year, and have been a thoughtful, reliable leader for your class. You are both beloved by your peers and it is evident to all of us that many of them have stepped up for Bates because of the two of you. George and Dottie, thank you for all that you have done and continue to do for the college. You are truly two of Bates’ Best. The following alumni and parents received their Bates’ Best awards on Saturday, Sept. 23, 2017, during Back to Bates: Homecoming & Family Weekend. In acknowledging Ken Snow, there are two important rubrics to consider: what he has accomplished for Bates and how he has gone about it. For nearly 30 years, Ken has been a class agent or lead class agent for the Class of 1962. In recognition for his service to the college, including 17 years as a career advisor for the BCDC, three years on the Alumni Council, and a year as recording secretary of the College Key, Bates wisely honored him with the Alumni Community Service Award. In the midst of all that, Ken also found time — 17 years to be exact — to serve the Office of Admission as an alumni interviewer. For helping encourage the best and brightest high school students to choose Bates, he received the college’s Alumni in Admission Award. Just as important is how Ken has conducted his service to Bates. The many alumni who nominated him said he leads with a genuine spirit that reflects a love of the college and Bates alumni. He cares deeply about everyone and takes a thoughtful approach to his outreach to classmates. He is a joy to work alongside, dedicated to the success of his class, and maintains a positive, grateful demeanor throughout any project. Ken, thank you for your loyal service, your personal philanthropy to Bates, and your deep affection for the college and all alumni. Congratulations — you are one of Bates’ Best. Jeanmarie and Colin, we have much to thank you for this evening. As co-chairs of the Parents Executive Council, you have made the college a philanthropic priority and modeled the importance of volunteerism for other Bates parents and alumni. As a result of your personal outreach, 81 families joined the PEC and made gifts totaling $738,000 to the Parents Fund — more than half of all annual giving from Bates parents. You have also graciously opened your home in Guilford to welcome new families to the Bates community in Connecticut. Whether you are cheering your son, Eli, Class of 2019, and his lacrosse teammates at home and away games, encouraging the Class of 1985 to make special Reunion-year gifts, or serving as career advisors for the BCDC, you always go the extra mile to support the college and the Bates community. Thank you, Jeanmarie and Colin, for all you have done and continue to do for Bates. Congratulations, you are truly two of Bates’ Best. Mike, it’s no stretch to say that you are among the college’s most active volunteers, coast to coast. Through your involvement in the Bay Area Bates Network, you helped coordinate a volunteer leadership seminar to ensure a splendid turnout for the San Francisco Campaign launch event. As a member of the Alumni Council, you were one of an intrepid few to attend all three Campaign launch events in Boston, New York City, and San Francisco. Through your business travels as senior vice president for Charles Schwab in San Francisco, you make yourself available to meet with Bates alumni across the country, keeping them connected to their alma mater. And by making Bates a philanthropic priority, you have provided students with financial aid support so that they can take advantage of a Bates education. Thank you, Mike, for all you have done and continue to do for the college. Congratulations, you are truly one of Bates’ Best. Tracy, you have been instrumental in providing Chicago-area alumni and families with highly engaging programs. In 2016, you and your husband, Brad, Class of 1992, brought the Bates community together at the Chicago Shakespeare Theater to see Othello: The Remix, featuring acclaimed actor and director Postell Pringle, Class of 1998. Last spring, you introduced alumni and families to Jonathan Pereira, Class of 1998, who — as executive director of Plant Chicago — hosted a tour of his organization’s farmer’s market, followed by a craft beer tasting. Your events celebrate not only the venues and organizations that make Chicago special, but the contributions that alumni make to your community. Your collaboration with Chicago’s after-school program MetroSquash and Bates Head Squash Coach Pat Cosquer, Class of 1997, has brought many accomplished student-athletes to the college. Tracy, your energy and enthusiasm inspires those who serve with you on the Alumni Council and your Reunion Committee. Thank you for all you have done and continue to do for the college. Congratulations, you are truly one of Bates’ Best. Jeff’s engagement with the college now spans more than 50 years, a remarkable record of service. Here are just a few highlights: He is president of the College Key and a member of the Alumni Council. He served on the Bates Board of Trustees from 2000 to 2005 and is now a member of the Cheney Society. He was president of the Class of 1969 for more than 20 years and has been a lead class agent, a Reunion Committee member, and Reunion Gift Committee chair. He has been a leader in the Androscoggin Bates Club and the Bates Alumni Fund Committee. A Deansman and member of the Bates football team in his student years, Jeff coordinates and participates in Deansmen Reunions and provides commentary for webcasts of Bates football games. This isn’t the first time the college has wisely chosen to honor Jeff. He is a recipient of the Helen A. Papaioanou ’49 Distinguished Alumni Service Award and was inducted into the Bates Scholar-Athlete Society. Jeff, your many accomplishments in service to the college have brought honor to the Bates community, as well as to your father, Dean Sturgis, Class of 1949, your mother, Erma Rowe Sturgis, Class of 1946, and your daughter, Jodi Sturgis Coppetta, Class of 1993. Thank you, Jeff, for all you have done and continue to do for the college. Congratulations, you are truly one of Bates’ Best. The following alumni received their Bates’ Best awards on June 10, 2017, during Reunion Weekend. 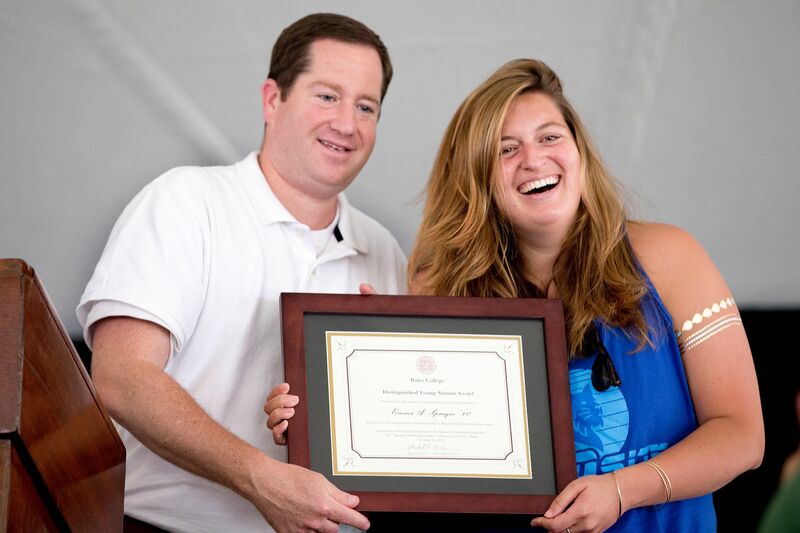 Katy, as a member of the Reunion Committee, you were instrumental in the Class of 2007 setting a new Bates record for 10th Reunion attendance. As a loyal class agent and a member of the Reunion Gift Committee — and even stretching back to your senior year, when you made your first foray into higher education advancement as a BatesStar class fundraising volunteer — you have helped your classmates understand the importance of philanthropy in strengthening the college for generations to come. It’s no wonder that you found your professional calling in the field of Alumni Relations and Advancement. Harvard is lucky to have you! Those who nominated you say they have never met a bigger cheerleader for Bates. And, for my part, I agree wholeheartedly. Katy, you were the person who most encouraged me to enroll at Bates. Following your advice was one of the best decisions I’ve ever made. To this day, I know you are a compelling advocate for the college. Katy, thank you for your commitment to alumni and the college. In honor of your loyal service and generosity, you are truly one of Bates’ Best! Leah, as you know, Bates’ Best honors are awarded annually to dedicated volunteers who demonstrate a passion and commitment for advancing the mission of the college. Because you have been in the employ of the college for the last 16 years, you technically haven’t been eligible for this honor. Now, as you prepare to embark on this next chapter with your family, it’s your turn. I am honored to present you with this most special award. No one is more deserving of the honor. There probably aren’t many gathered here tonight who don’t know about your stellar career at Bates. You joined College Advancement in 2001 as Assistant Director of Alumni Relations and steadily rose through a series of positions that focused on alumni engagement, volunteer management, annual giving, and the Mount David Society, culminating in your promotion to the position of Assistant Vice President, in 2013, with responsibility for the Bates Fund and Alumni and Family Engagement programs. In each of these roles, you helped alumni, parents, and friends celebrate their passion for Bates. As we have shared the news of your impending departure, the praise has flowed in. Trustees, volunteers, and colleagues across the campus have expressed gratitude for all that you have accomplished. And for your tireless commitment to achieving “best in class” in all of our programs. Leah, you leave the Office of College Advancement to devote yourself full time to raising your beautiful sons, Ollie and Elliot. They are truly lucky. And we at Bates are truly lucky to have had you as a colleague, a leader, a mentor, and a friend for the past 16 years. I know I speak for everyone at the college when I say that you will be missed. But we will be happy to think of you and Chris in Freeport, not so far from Bates, making your community and its schools and organizations stronger through your involvement. Just as you have worked to remind alumni that Bates is their home, let me say what you already know — that Bates is also your home, and our doors will always be open for you. We look forward to seeing you, Chris, Ollie, and Elliot often. Thank you, Leah Wiedmann Gailey. You are truly one of Bates’ Best. Keith, you are a tireless organizer for Bates and the Class of 1967. Through recruiting classmates for the Reunion Gift, Social, and Yearbook committees, as well as your own efforts, you have played a central role in making all aspects of the 50th Reunion a tremendous success. The 50th Reunion Yearbook Committee, which you co-chaired with Joanne Hayes Healy, produced a keepsake that perfectly captures the spirit of the Class of ’67 and features a wonderful compilation of biographies and memories that will be treasured by your classmates for years to come. Thanks to the biannual “rendezvous” you coordinate — one on campus and the other in Mystic, Connecticut — as well as your regular humor-filled emails, the Class of 1967 enjoys an exceptional level of camaraderie and connection. Thank you, Keith, for your longstanding devotion to ensuring your classmates’ hearts are never far from each other or from the college. You are truly one of Bates’ Best. As I’m sure all of you know, Aya is all in for Bates. As a testament to her dedication to the college, consider this: she and her husband, Mike Charland, of the Class of 1993, named their firstborn son after the college — Aki Bates Charland. Aya joined the Alumni Council in fall 2015 and made an immediate impact. She led the Council’s Second Decade subgroup in developing and executing an informative survey that gave Bates a better understanding of how to offer alumni of the 1990s more meaningful programming and communications. As associate dean of college counseling at Phillips Academy, Aya is perfectly positioned to serve the college as an Alumni in Admission interviewer, something she has done for the past 17 years. She also has been a class agent and was instrumental to the Reunion committee’s efforts to make your 25th a splendid event. Those who nominated Aya say that her warmth, her love of Bates, and her devotion to alumni rally others to join her in turning out for Reunions and Boston-area Bates events. She brings out the best in Bates alumni. Aya, thank you for your loyal service, your philanthropic commitment to Bates, and your deep affection for the college and all alumni. Congratulations — you are one of Bates’ Best. Mikey, you have recruited classmates from all corners of the country to join you in serving on the Reunion Committee and making your fifth Reunion a huge success for the Class of 2012. As class co-president and Reunion chair, you keep your classmates and the college informed and connected through your steadfast and savvy management of the class Facebook page. Through your work with Alumni in Admission — as an admission fair representative, an interviewer, and an event host — you help the best and brightest high school students find their way to Bates, thereby strengthening the college with future generations of successful and highly engaged alumni. And I would be remiss if I didn’t also acknowledge the work you did in your senior year to launch Bates Night in Town, a vital town-gown partnership that introduces students to the diverse dining options and cultural opportunities offered within their host community of Lewiston-Auburn. Were they here tonight, the proprietors of She Doesn’t Like Guthries, Lyceum Gallery, Gritty McDuff’s, Chopsticks, and Pedro O’Hara’s, among other downtown hotspots, would no doubt express their gratitude to you for this initiative. Mikey, thank you for your commitment to alumni and the college. In honor of your loyal service and generosity, you are truly one of Bates’ Best!